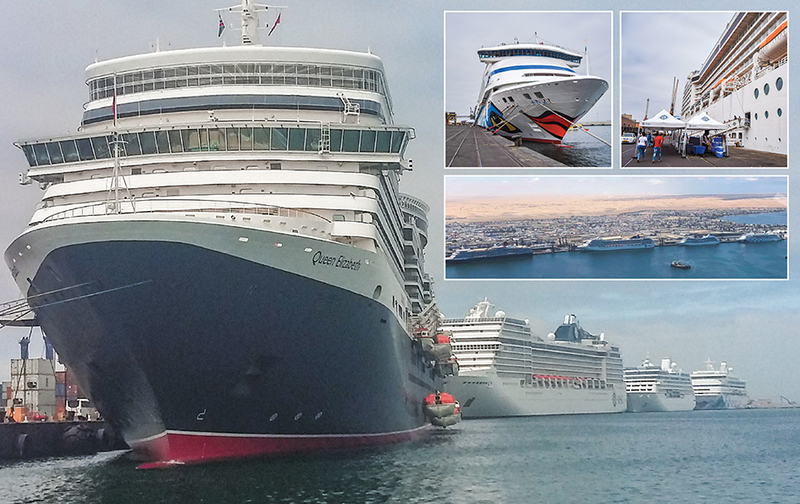 A VIRTUAL carnival atmosphere enveloped Walvis Bay on Wednesday as history was made in the port when four luxury cruise liners came alongside and moored at the docks all at the same time. The MSC Musica, the Nautica and the Queen Elizabeth arrived in the port on Wednesday morning. 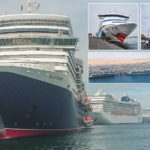 The simultaneous arrival of the three vessels in the Walvis Bay harbour was preceded by the arrival of another passenger liner, the Aida Auro on Tuesday and more than 7 000 visitors disembarked from the vessels to take in the scenery in and around the two main coastal towns. Another historical first for the port was the arrival of the Queen Elizabeth. It is the first time this gentle giant lady of the seas moored at the docks. Her sister ship from the Cunard shipping line, the Queen Mary, has already visited Walvis Bay twice before. The four giant vessels took up all the berth space along the quay and dwarfed Walvis Bay on the land side. Apart from the four new ship-to-shore cranes standing on the new container terminal quay, the four ships were the highest structures in the port town for a period of 24 hours. As passengers disembarked from the four vessels in droves, the formal and informal business sector jumped into action to welcome the visitors from abroad in their own unique, individual and special way. Several curio sellers set up shop on sidewalks at both entrances of the port premises and taxi drivers formed a crowd and held aloft handwritten posters advertising their fares to obtain potential customers under the watchful eye of Namport security officials and several police officers. Scores of tour buses stood lined up in front of the harbour gates and inside on quay many more were loaded to capacity with groups of visitors who went on sightseeing trips in and around the main coastal towns. Tour operators specialising in bird watching and different kinds of day trips into the dunes, as well as other nature adventures also lined up in their numbers to do business with the visitors from abroad. Makeshift stalls were set up on the quay by other operators in different sectors of the tourism industry. Their aim was to speak to disembarking visitors about possible return trips to Namibia and them going on safaris and visiting game farms if and when they eventually did return. Amongst the most profitable business done with visitors from cruise liners, is the sale of Namibia’s unique philately or postal stamps and postcards. Employees of NamPost also set up a small gazebo at one of the entrances of the port and a steady throng of tourists crowded the makeshift stall for hours on end. Officers of the municipal traffic department blocked of the street leading to the main entrance of the port to ensure the safety of the many visitors who chose to go sightseeing on foot. The Namibian Police ensured a visible presence of officers on all the street corners in the central business area of the port town to deter the few opportunistic criminals who might attempt to steal from the wandering visitors. While standing in the street leading up to the port entrance surrounded by scores of passing visitors, Deputy Commissioner Tobi Gerber, Head of Police Operations in the Erongo Region, said the security measures taken in preparation for the visit of the four vessels was extraordinary. “We don’t expect too much trouble, but there are always those few who would still take a chance and we are definitely focusing our efforts to prevent just that. We also sometimes have to help some of the visitors when they get lost. Unbelievable to us who live here but it has happened before and the people are always thankful,” he said. Another unique story emerged as the day of the visitor invasion progressed. Two passengers who missed the departure of the Queen Elizabeth at the start of the cruise 13 days before her arrival in Walvis Bay had to be fetched from the Walvis Bay International Airport in order for them to embark and complete the cruise. A resident of Walvis Bay who are friends of friends of the family of the visitors on Facebook organised and facilitated the transfer from aeroplane to ship.